Sometimes I take these little self dares and see if I can fix some code or add a new feature in the time it takes me to eat breakfast. I was a wee bit over here, but oh well. 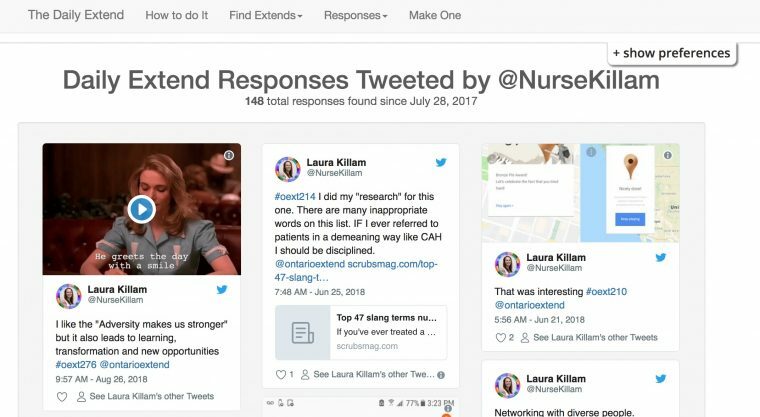 It all started with a tweet about the Ontario Extend Daily Extend site, which uses the DailyBlank WordPress theme I made. Loving the layout of this page by the way. How did you do it? Laura is referring to the leaderboard, something that really motivates some folks. Like Laura. And she is right- the leaderboard shows she has done 66, yet if you click the link for her name, it shows quite a bit more. 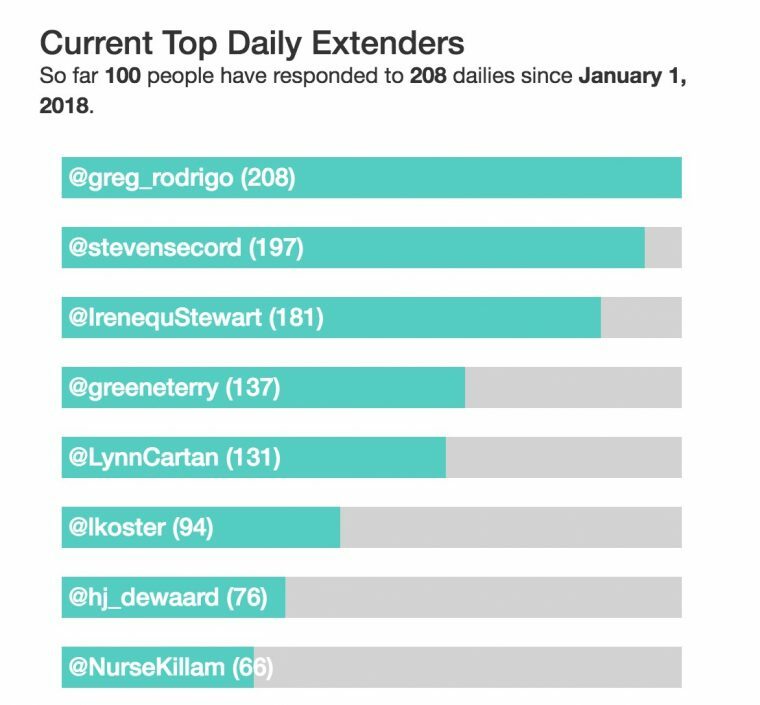 The current leaderboard shows your responses since Jan 1, 2018 – the link to yours shows all time. And if you go to the all time leaderboard you will see that Laura gets her full 148 count. 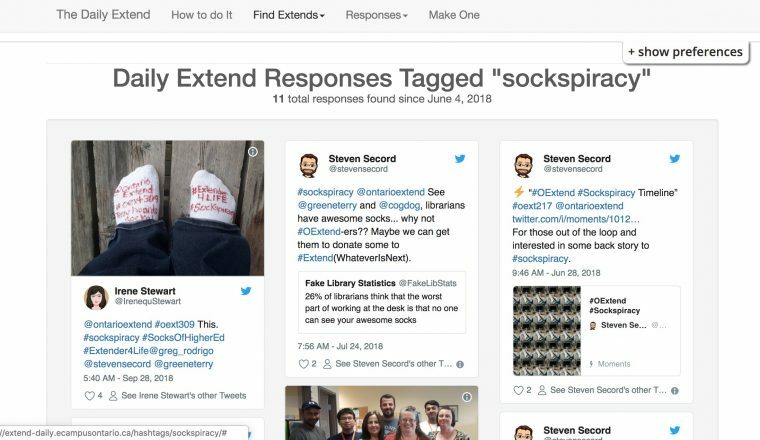 To step back a bit, data for each response to a daily extend in this theme is saved as a WordPress custom post type called “Response”. It saves the tweet text, it’s URL, the name of the person that tweeted. It also converts all @symbols in the tweet to tags, as well as any hashtags. Actually these are a custom taxonomy called hashtags. 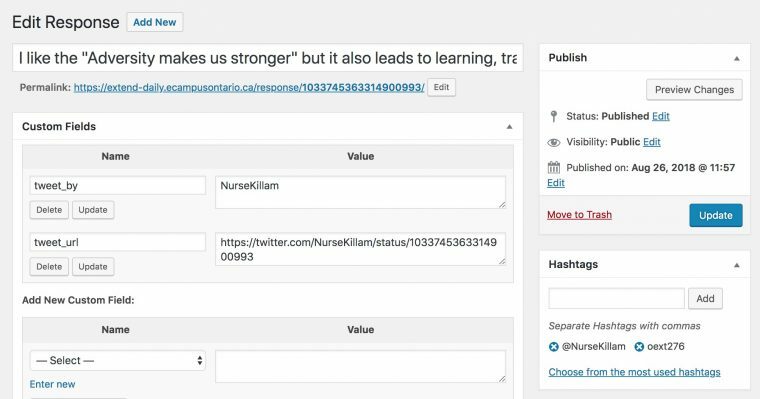 Having this in WordPress as data allows the theme to do things like display all responses by a person or a hashtag, as well as being able to generate the leaderboard. I’m kind of proud of how I have leveraged this. So all I needed to do was add some code on the taxonomy-hashtags.php template that generates a taxonomy view to display the date of the oldest one it finds. I first mocked up something that made use of the fact I already have a $wp_query object to use. I did some testing by doing a var_dump() of things until I drilled down to where it was, something like get_the_date('', $wp_query->post[$found_posts-1]->ID) (drawing from memory). I was testing this on a splot site not in use. And it seemed to work, I was able to add a date since to the sub-title. I then put the new code up to the Daily Extend site. It displayed a date, but it was only like a few weeks ago, not way back. I fiddled and blindly made changes (and doing the BAD thing of testing on a live site), and the date kept being way to recent. 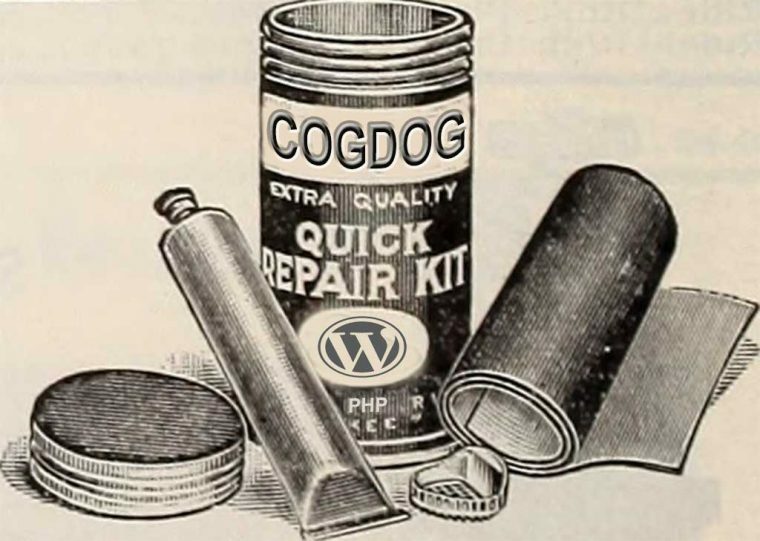 Then it dawned on me I Was Doing It Wrong– it worked on my small test site because the number of responses returned was less than the breaks WordPress does in queries to make paginations. I was not getting the date of the oldest response, I was getting the date of the oldest one on the current page when there were more than 10. That was my relatively quick fix, with one dead end and turn around. I can see how to do this, it might take another breakfast to do. Featured Image: Modified from Image from page 131 of “1930 Griffith and Turner Co. : farm and garden supplies” (1930) flickr photo by Internet Archive Book Images shared with no copyright restriction (Flickr Commons) by photoshopping in the label, a WordPress logo, and a little “PHP”. Kind of proud of this fiddling. Do not ask me why I spend time doing this. Awesome! Now I know it is possible to collect and display data like this. Unfortunately, I don’t have time to do that to my course website yet … I still need to work through the pictures on the syndicated posts (I have the instructions). You inspire me. You are a true WordPress genius. People think I know things about WordPressing, but all I know I got from you … and I know how to do only a fraction of what you do. I hope we can have a Domain Boot Camp someday! Maybe January – a New-Year’s resolution theme.